Anna Palmer is a New Zealand born artist who specializes in dichroic glass jewellery and pastel drawings. 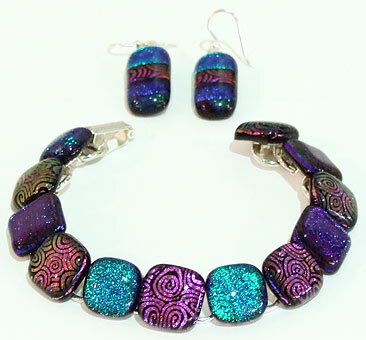 Since teaching herself to make dichroic glass jewellery in 2005 Anna has created stunning pieces of wearable art which sell in Aotearoa / New Zealand and to a growing international audience. Contemporary dichroic glass is made up of multiple ultra thin layers of dichroic metals vaporised by an electron beam in a vacuum chamber. The vapour then condenses on the surface which gives the glass dichroic optical properties. This coating, which is approximately 35 millionths of an inch thick, is similar to a gemstone. By careful control of the thickness, dichroic colours are obtained. Early examples of this glass making process date back to at least the 4th century AD. Anna’s passion for colour creates work of immense warmth and fiery iridescence.